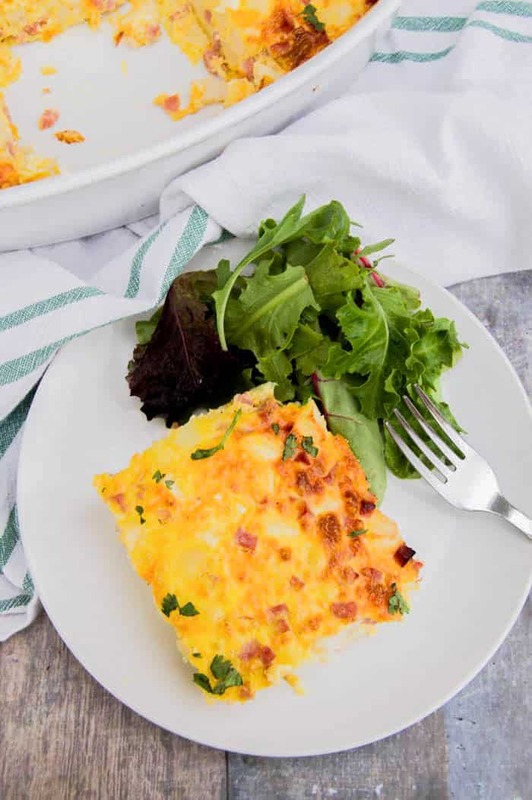 This Ham and Potato Breakfast Casserole is made with four simple ingredients and seasonings. It’s simple to make and my kids loved it. You can also check out my tips for freezing this and having it for later. Let’s start with preheating the oven to 375 degrees F. Now prepare your casserole dish with nonstick cooking spray. To your casserole dish add hash browns, ham, and cheddar cheese. Mix together then add in whisked eggs and gently mix again. Add seasonings and mix until combined. Bake for 45-50 minutes until eggs are cooked through. Poke with a toothpick or butter knife and you know it’s done when it comes out clean. I used a 12 x 9 casserole dish for this recipe. Others would work but cooking time could need to be adjusted. Freeze in servings: You get a wonderful breakfast but don’t have to wake up an earlier to make it. I also love making them into single serving breakfast squares that I can eat all week long. After cooking allow your casserole to cool. Cut it into squares and place them on a baking sheet. Place in the freezer into each square is frozen. You can now place all the squares into a large freezer bag and they will not stick together. Pull out one at a time for breakfast and warm in a toaster oven or microwave! Freeze in whole: To freeze the entire casserole cook according to directions (in a freezer friendly dish, I like to use foil dishes when freezing) then allow to cool. Cover with foil and place in the freezer. Place in the fridge 24 hours before you are ready to bake and place in the oven at 375 for 60-90 minutes to until warmed through. 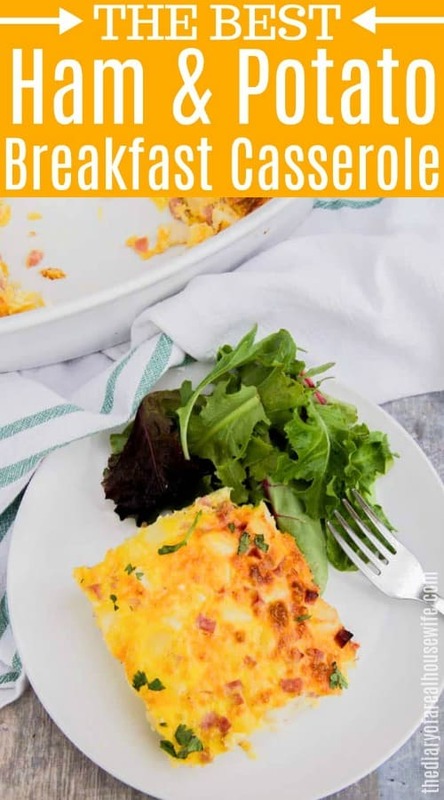 Egg casserole dish can usually stay good in the freezer for 2-3 months. French Toast Casserole: Your favorite breakfast dish baked all together in this easy French Toast Casserole. Don’t worry this isn’t an overnight recipe, it’s ready in an hour. Bacon and Egg Breakfast Burritos: Perfect breakfast recipe to freeze for easy breakfast all week. These Bacon and Eggs Breakfast Burritos are simple to make with bacon, salsa, cheese, wrapped in a flour tortilla. Biscuit and Gravy Casserole: One of my favorite breakfast baked all into a casserole. This Biscuits and Gravy Casserole is made with an amazing sausage gravy bottom layer and topped with biscuit pieces and baked. 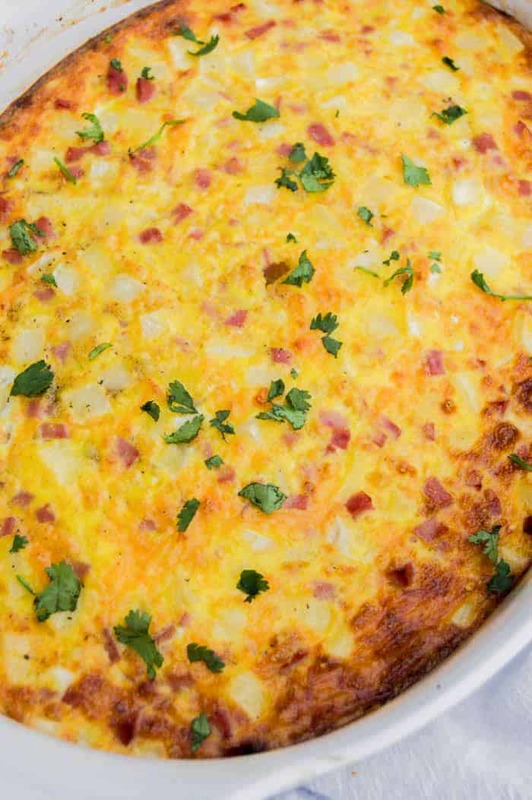 This Ham and Potato Breakfast Casserole is made with four simple ingredients and seasonings. It's simple to make and my kids loved it. You can also check out my tips for freezing this and having it for later. Preheat your oven to 375 degrees F. Prepare a casserole dish with non stick cooking spray. To your casserole dish add hash browns, ham, and cheddar cheese. Mix together then add in whisked eggs and gently mix again. Add seasonings and mix until combined. Bake for 45-50 minutes until eggs are cooked through. Poke with a toothpick or butter knife and you know it's done when it comes out clean. Optional: I served mine topped with fresh parsley. My husband would love this! Thanks for the recipe!